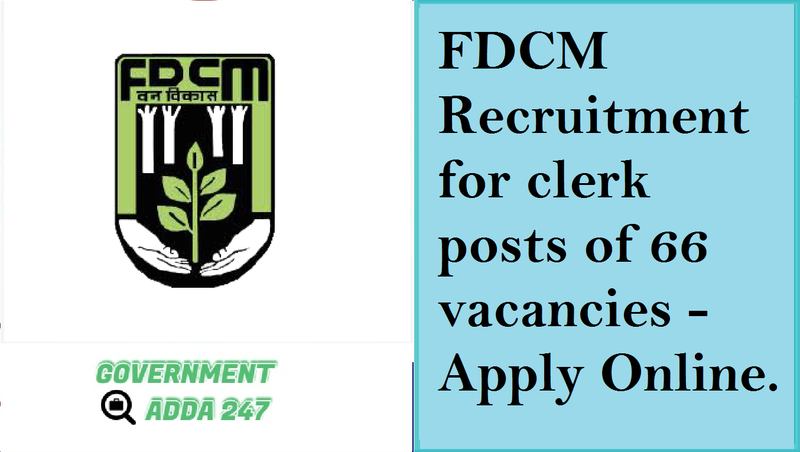 Government Adda 247 FDCM Government jobs Maharashtra Jobs FDCM Recruitment for clerk posts of 66 vacancies - Apply Online. Maharashtra Forest Development Corporation Department Limited Recruitment/ Maharashtra FDCM Recruitment 2018, FDCM has released the notification for the recruitment of clerk in the forest department. The total number of vacancies for recruitment are 66 posts. All the eligible and the interested candidates can apply for the posts from the 26 November 2018, and the last date to submit the online application is 24 December 2018. To know more about Maharashtra FDCM Recruitment check the information given below. एक माण्याप्रप्त विद्यापीठ से बी.कॉम. डिग्री ,इंग्लिश टायपिंग 40 शप्रमी / मराठी टायपिंग 30 शप्रमी और एमएससी-आयटी. आयु सीमा : न्यूनतम: 18 साल, अधिकतम: 30 वर्ष. ऊपरी आयु सीमा अनुसूचित जाति / अनुसूचित जनजाति 5 साल, अन्य पिछड़ा वर्ग 3 साल, विकलांगों को 10 साल, पूर्व सैनिक को 5 साल.